Work has already started on the planning phase of the Student Record System (SRS) for the School of Prosperity (SoP) and everyone is excited about this new system. As the software architect of this project, you met with many users and stakeholders of the old system to determine the requirements of the new Internet-accessible SRS software system. Your meetings and requirement-gathering efforts resulted in an SRS Requirement Definition document that summarizes all of the requirements of the project. One of your development team members was excited about this project and wanted to start working on it immediately. She therefore took the initiative and created a high-level business process activity diagram for the SRS system. You reviewed the activity diagram and found it to be a good foundation from which to create the SRS use case diagram and the SRS use case descriptions. There is still work to be done to complete the Functional Modeling of the SRS. 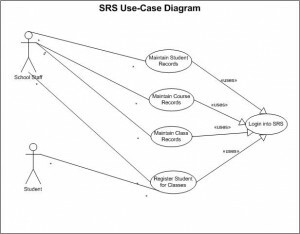 Your deliverables for this week’s iLab are the SRS use case diagram and two use case descriptions for the Maintain Class Records and the Register a Student for Classes use cases. •	Download the SRS Requirement Definition and review it to prepare for your deliverables this week. •	Download the SRS Business Process Activity Diagram and review it to prepare for your deliverables this week. •	Download the Use Case Description Template and use it for your deliverables this week. •	Create the use case diagram for the SRS system using the Rational Software Architect software on the Citrix iLab environment. Pay attention to the possible need for Include and Extends relationships. •	Create use case descriptions for the two major use cases in the SRS system. These two major use cases are the Maintain Class Records and the Register a Student for Classes use cases. See the Figure 5-5 example in the text. Be sure to include all deliverables in one Word document. Copy and paste the use case diagram into the same Word document that contains the use case descriptions. Save your document with the file name CIS339_Lab2_YourName. Hi, My instructor required only four to five use cases. It should not be a detailed diagram. Do you have such use case diagram? Yes you can see the screenshot. It only has five use cases. I have follwed the complete requirements as per the class. I purchased this lab from you and you have used <> instead of <> . is this ok? Hi i purchased this lab. great work man. Cheers.